I saw a very strange thing happening today. 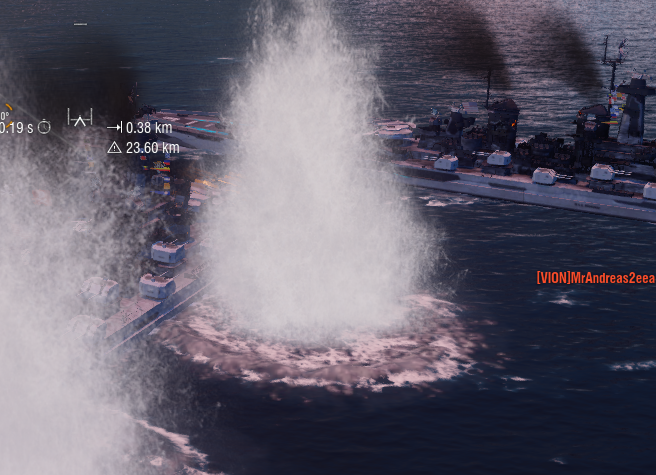 I collided in my Montana with another Montana and it seemed like the ships have become "glued" at exactly the point you see on the screenshot. This continued until the end of the game for a duration of 10 minutes. No matter what I did, I couldn't separate my ship from the other ship. I couldn't reverse and I couldn't accelerate. I was stuck at 4.6 knt. Does anyone have an idea why this has happened? I think it is a technical issue. Yes, this is a bug. Some ships seem to have areas at their hull where other ships can get stuck. Maybe they can implement a quick command "Please, ram me", similar to "Provide AA support"?